A valuable bronze sculpture of a baby which lay forgotten in an administration block at Holloway Prison has been rediscovered thanks to a Kingston University academic, and will soon be seen by the public for the first time in more than half a century. 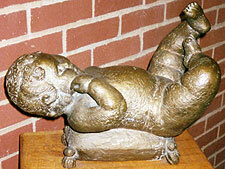 Happy Baby, by sculptor Dora Gordine, has remained inside the prison walls since its installation in 1948, which marked the opening of the institution's first mother and baby unit. Prison authorities had no idea of the importance of the bronze sculpture, which had been moved to an administration wing during refurbishment work in the 1960s, until Kingston University's art historian Dr Jonathan Black got in touch to try to track it down. "I had my fingers crossed, hoping the sculpture was still there somewhere," Dr Black said. "Like so much of Dora's life and work, Happy Baby has remained out of public view until now. It's such an important piece and one that Dora was really chuffed about. When she heard that the female prisoners enjoyed holding their babies next to the sculpture and touching or stroking it, she was thrilled. The prison authorities were really surprised when I explained what a significant artwork it was." Happy Baby is now set to form the centrepiece of the world's first major exhibition on the forgotten artist, which is being staged by Kingston University and Kingston Museum with the help of a £46,000 award from the Heritage Lottery Fund. The work was originally commissioned by prison visitor Rosalie Holmes, a surgeon's wife and art enthusiast who campaigned for better conditions at London's Holloway during the 1930s and 40s. Mrs Holmes paid for the sculpture out of her own pocket and persuaded the institution's first female governor to allow its installation, describing the prison as a place "hungry for beauty". At the time, few, if any, of the women were allowed to keep their babies, who were put up for adoption. Although she had no offspring, Gordine – who has works in the Tate and the V&A archives – referred to all her sculptures as "my children". Dr Black is certain the work was sculpted from life, but the identity of the infant model is unknown. "She must have borrowed a baby from somewhere, but we have no idea who it was," Dr Black said. With bronze severely rationed during the Second World War, as it was needed for military equipment, Happy Baby, which Gordine started crafting in 1947, marked a return to her favourite medium. Latvian-born Gordine, who spent her teenage years in Estonia before marrying into the British aristocracy, was revered across the globe for both her art and her lavish celebrity-studded parties. Critics acclaimed her as ‘possibly the finest woman sculptor in the world'. But when her husband died suddenly in 1966, Gordine became a virtual recluse in the art deco home she had designed on Kingston Hill, living alone there right up to her death in 1991. The house, which had fallen into disrepair, was offered to public ownership without success. Three years later, Kingston University stepped in with a £750,000 restoration proposal and the estate executors entrusted it with the house and contents. Dorich House has since been lovingly restored to its former glory and includes an impressive collection of 19th Century Imperial Russian art that belonged to Gordine's husband Richard Hare as well as her own sculptures, paintings and furniture. "It's wonderful that at long last, the retrospective will give everyone from the art enthusiast to the historian, a chance to explore Dora's life and works," Dr Black said. "She's been unappreciated for far too long."